Make Every Celtic Wedding Detail Special. You can spend a lot or a little on gifts for your friends. It's always nice to offer them a keepsake they can wear during the wedding such as a kilt pin or a sgian dubh. Pocket watches are another classic gift. And if anyone needs something a wee bit medicinal to relax, you can always provide it in a pewter whisky flask or Glencarin glasses! A celtic brooch pin can make a lovely gift and memento that they can wear on a jacket lapel or pin on a purse to remind them of your special day. Tartan items like shawls and sashes can be worn during the ceremony and enjoyed for years to come. Bridal showers, the girls night out, and wedding rehearsals are all occasions for having a little fun with your wedding experience. If you and your besties want to really go for broke, you can gift them with a custom mini-kilt. You can even get matching ones! Mini-kilts are also a fun packable bit of celtic flair for your honeymoon vacation (or wedding night?). Kilts are available for small kids and young adults, so your ring bearer can be outfitted like your groomsmen. Sporrans also come in miniature sizes for the wee lads. For the flower girls, consider using a half-length tartan sash. It’s easy to attach to any wedding dress you have selected for them. You can help your family and friends look and feel more included by outfitting them with sashes, shawls, pocket squares and other small items made from tartan cloth. 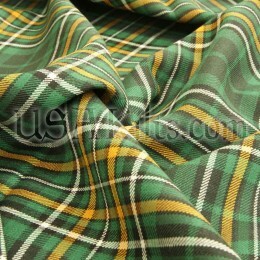 The tartan can be yours, your soon-to-be spouse’s, or another plaid altogether. There are many universal tartans which are not only beautiful, but easy to work with for matching your wedding color theme. For example, Sterling or Isle of Skye. Wedding party participants can also wear celtic accessories such as kilt pins, brooches, Scottish or Irish hats or tartan neckties. The obvious choice for adding a touch of Ireland or Scotland to a wedding is to use tartan. Tartan cloth isn’t just for kilts, sashes and shawls. It can be great for an altar cloth, ring pillow, tying the bouquet, making rosettes, table runners, wrapping around centerpieces, the hand-fasting, etc. Sometimes gifts for the couple can be used as decorations, too. For instance, if the wedding is Irish, a wooden Claddagh wall carving can be a striking centerpiece for the altar space or on the front of the bridal party table at the reception. The Quaich can be used as part of a centerpiece, or as part of the bride / groom first drink toast as well. After all, that’s what the quaich is for… sharing a drink with friends! Clearly there’s a lot of tradition behind the wedding rituals we have come to enjoy today as “Celtic” -- be it Scottish, Irish or Welsh. We hope this guide has been helpful. Remember -- what you choose to wear and which traditions you choose to follow is all up to you. If you would like more detailed information or some help with ideas and options, we invite you to contact us at USA Kilts. E-mail us. Or call 1-800-368-8633. One of our Customer Advisors will be happy to help make your special day one to remember.